Men of the 1st Idaho Volunteer Infantry, Co. B.
Rear Row (left to right): Cpl. Alvis Kaloris, Cpl. John H. Little, Thomas Martin, and Musician Isaac Hutchinson. 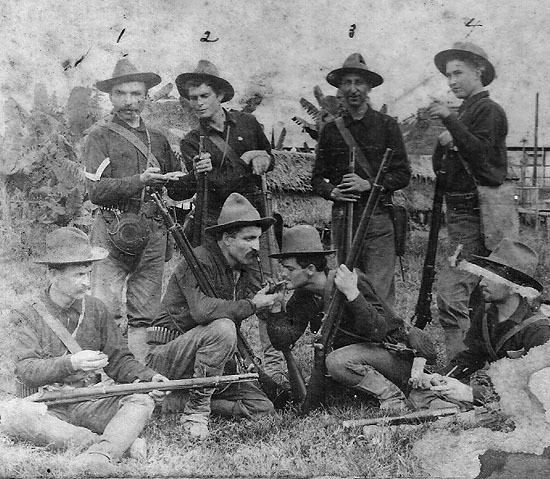 Fraser was killed on February 5, 1899, the second day of the Philippine American War. Frank McCall was wounded the same day. 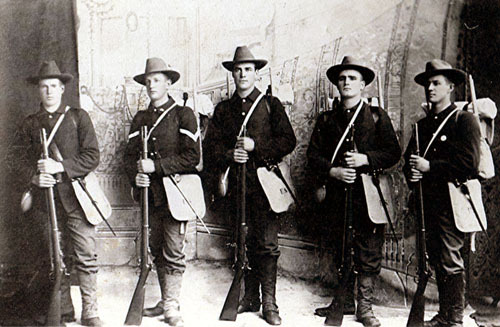 37th United States Volunteer Infantry Regiment on July 5th, 1899.
of Major Figgins; commanded First Battalion. Regiment; killed in action on February 5th, 1899, at Santa Ana, Philippine Islands. Osborn, Tremain M., Sgt. Maj. - Mustered into service as a Sgt. in Co. D; promoted to Regimental Sergeant Major. Fenn, Fred D., Band Sgt. Hunt, Frank W., Capt. - Mustered into service as 1st Lt. of Co. G; Promoted to Capt., Co. A, on promotion of Captain McRoberts. Syms, Henry J., 1st Lt.
Steunenberg, George E., 2nd Lt.
Watson, William H., 1st Sgt. Dyer, Willard C., Quartermaster Sgt. Martinson, Edward O., 1st Lt.
Stainton, Robert D., 1st Lt.
Barbour, John O., 2nd Lt.
Wilcot, Chipea, 2nd Lt. Mustered into service as a Pvt.,; promoted to 2nd Lt.
Graham, James, Capt. - Mustered into service as Regimental Quartermaster, promoted to Capt. Hartman, Richard H., 1st Lt.
Holden, Edwin M., 2nd Lt.
McKenzie, Fred N., 1st Sgt. McDermid, Hugh M., Quartermaster Sgt. Gage, Wells E., 1st Lt.
Bell, James K., 2nd Lt.
Armstrong, Charles H., 1st Sgt. Harris, Frank E., Quartermaster Sgt. on promotion of Lt. Castle. Barrows, Leander S., 2nd Lt. - Mustered into service as 1st Sgt. of Company E; promoted to 2nd Lt..
Maryon, Percy W., Quartermaster Sgt. Kipp, William J., 1st Lt. - Served as a Pvt., and Cpl. in the 2nd U.S. Infantry, Co. G from June 24th, 1878, to June 23rd, 1883.
in the 11th U.S, Volunteer Cavalry on August 12th, 1899; accepted the appointment on September 6th, 1899. Busby, Isaac M., 2nd Lt.
Dunn, Alfred J., 1st Sgt. Gillespie, William D., Quartermaster Sgt. 1st Lt. of Co. G when Lt. Hunt was promoted. Kane, John A., 2nd Lt. - Mustered into service as 1st Sgt. of Co. G; promoted to 2nd Lt. when Lt. Tschudy was promoted. Fisher, Julian F., Quartermaster Sgt. Castle, Levi:, Capt. - Mustered into service as 1st Lt., Co. E; promoted to Capt., Co. H when Capt. Fenn was promoted. Worthman, Harry C., 1st Lt.
Armstrong, Charles H., 2nd Lt.
Bruman, Fred E., 1st Sgt.